Hey, we hope you got a chance to enter the Win A Blue Tongue Camper Trailer Competition over the last 12 months. We be drew the winner’s details on Wednesday, June 27. Congratulations Colleen Ponchard of Victoria. 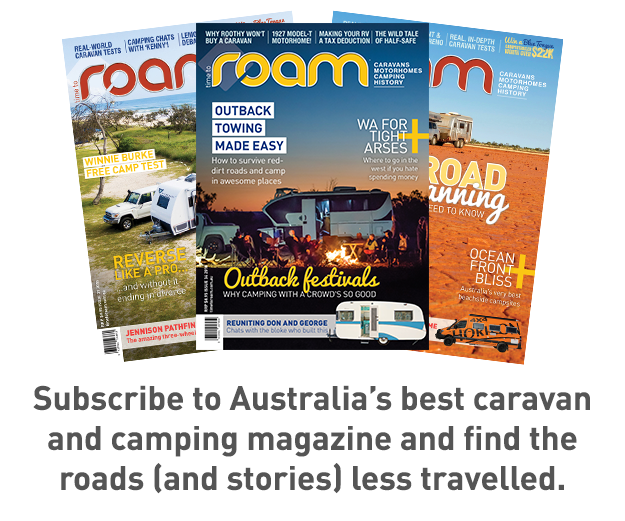 If you want to read more about Blue Tongue Campers, head here. Retired for a couple of years but want to do more off road. Already have a 16ft caravan but limited to off road camping. Looking for something trailer type preferably with 2 single beds and internal combo shower/ toilet but interested in outdoor set up. Also outdoor pullout kitchen. Swapped the caravan for an off road Jayco camper trailer. We have now been to some amazing places in the Kimberleys. Recent retired solo traveler . love Camping and the outdoors with like minded women. Have An Instand-Up tent at the moment but would love to have a small easy set up camper or campervan . We are retired & Love free camping with our current c/van which is a 2007 Regent series3, double axle, full bathroom. Bought it 2011 & have been right round once & never had a problem. Limited to well graded gravel & would like to upgrade to off road to see more outback places. This a very generous gift! To win some thing like this it would be amazing. Being part of the roam family is the way to go!! Would love to to win a camper van so my family could join my wife and me on camping trips,we could make it a family affair. Camper trailer are more versatile in getting in places than caravans, easier to tow with less drag and resistance. Easy to setup up at the end of days travel and have improved out of sight in realiability and durability. I would love one for off road and free camping anywhere in Australia to explore. My dream is to buy a caravan and travel this beautiful country with my wife and 2 daughters. One day if I can afford it. Wishing for the Great unwind. Enjoy caravaning and the comforts it gives ,however, camping puts you much closer to nature where you feel more involved in your daily activities and lifts you with the excitement of whether your cooking, setting camp for the day irrespective of whether it is raining or sunshinning . Makes you appreciate what our for-fathers went through. Haven’t had the funds set aside to undertake caravan in or RV stays. My husband said the only way it would happen is if I won one. Love going bush but my old camper is about to give up the ghost. Want to travel around Aus but can’t afford to replace the old one. There’s nothing better than taking a camper trailer bush and enjoying the peace. I love camping feeling free by sleeping outside. We borrow most equipment and trailers and still love every minute. I have a goal to save enough for my own camper and see as much of our awesome land as I can. I’d love to be a gray nomad, my dream lifestyle in the years to come! My husband and I currently own a caravan but would like to go more into the bush setting. At the moment these places are not accessible with the caravan and we are missing out on these idyllic spots. We are both slightly disabled but are determined not to let this stop our love of travel. absolutely fabulous as I’m struggling with setting up and packing up my current small pop top van. To be able to get away and recharge your batteries more often and preferably free bush camping would be a dream come true ? This would be a dream come true. We can only afford our tent for now so winning this would up the ante of our camping adventures dramatically ? We are getting near retirement. We used to have a tent and camp when our kids were younger but now they have the tents and swags. We want to have a camper to go with them. so! i only wanna enter the campertrailer comp!!!!! Hi Joy, fear not, you are entered. Brendan. Would love to win this camper trailer for my family to make some special memories with! As my kids are growing, they want to join me and husband for camping and also can’t leave their grandmum alone at home. So it would be so great for the whole family to enjoy their company. Would be great to have an easy tow camper to get away on the weekends. Kick back in the deck chairs at night and share the stars in the dark sky with my wife & a coldie. Been dreaming of something like this. Easy way to getaway on short notice and spend more time camping, less time setting up. Not a lot of campers this style in my neck of the woods. We love exploring Oz with our FJ and our tent and our 2 amazing boys. A camp trailer like this would be a perfect up size! We love exploring Australia with our FJ and our tent and our 2 amazing boys. A camp trailer like this would be a perfect up-size! Camp in Tents atm…but would love a camper trailer….be so much more comfy!!!! Ahhh, the peace and tranquility off road camping promises. Would love a camper trailer that I can manage so that I can take my 82 year old hubby and 2 little fur babies to experience this while still able! Family of 5! We camp in a roof top tent with Annex. We do alot of travelling around Queensland, would love to go further and will one day, but between school and work, it is very time limited. Mind you, we camp at least twice a term and every holidays. You see so many people travelling overseas and wanting to travel overseas to see all the best sights in the world. When they have never looked in there own back yard where there is the most incredible places in the world!! A camper trailer will allow my partner and I to travel for longer periods of time to see and enjoy more of this great country!! please send me a email so as to enter? The “enter now” button does not work on the Blue Tongue Camper Trailer competition page. Looks like it has not worked previously as well from earlier comments. Camping and being one with nature makes me feel alive. It is the best feeling and I have never felt better than when I am out camping. Winning a prize like this would be heaven on earth. Imagine other campers checking out one of these beauties!!! WOW!!! We travelled for 12 months 11 years ago with our son. But would love to go again with both of our kids now. ? I’d love a blue tongue camper, to explore this wonderful country of ours!!! My wife and I are nearing retirement age and would dearly love to travel this great land of ours. Due to circumstances we are not able to afford to buy a van or trailer. Winning this prize would be a dream come true for us. We love getting out and exploring as much as we can. Currently planning a half lap of oz (for now) just trying to work out the best time to do it in a tent, and working out stops along the way that you don’t need a self contained. We love our camping but would love our camping even more with an upgrade to a blue tongue camper! A blue tongue camper would give us the opportunity of travelling to outback areas on our bucket list that have been beyond our present rigs capability. I would love to win the Blue Tongue camper to show the kids this beautiful land of ours. More importantly to get them off the iPads. Thanks for letting me be a part of the comp. I subscribe to your magazine. Such a great read and super informative. We love to enjoy our Avan Cruiser by a river or lake , with a campfire and the evening stars in outback Australia. This would be a dream come true. We could never afford a luxury like this. To be able to take my family camping would be the greatest thing I could ask for. Quality time with the kids and husband and to be able to have a break from reality is something much needed and would just be so enjoyable. To win this Ausi built blue tongue camper trailer would be a game changer for our off road holidays .The superior finnish and quality along with a fast and easy set up would make going off road a dream. Would love to have a chance to win this camper as I like the concept of forward fold and no ladder to climb! We love the camping lifestyle and are currently travelling in our wonderful campervan that we manage to keep going. The Blue Tongue overland II would allow us to go to more out of the way places and off the bitumen. Thanks for the opportunity to enter. In the wild, free and easy. Would love to win. Doesn’t appear to be letting me enter. Would lovevvto do more travelling and camping. My sincere condolences Donna. I am so sorry to hear about your husband, times are tough for many of us older Australian’s. My grandchildren are also my world and I hope you get to take them Camping for many years to come. It will be something they will remember for their lifetime. I love Camping. The problem is that I suffer Chronic Pain due to a back injury and failed surgery. Our son purchased a Camper Trailer, he lives in Vic, we live in Tas, so he has told us if we ever want to take it for a holiday just pick it up as we go through. This saves us so much extra cost on the Spirit of Tasmania, I am proud of him, he is a good son. We will be able to travel now in comfort and safety the way we want to. I am really looking forward to visiting family in Adelaide, Port Lincoln and Ceduna, and Vic, ACT and Queensland. I have to wait until our pet cow ‘Molly’ passes away which I am not looking forward to as we have had her since she was 3 days old, and she is now 16. We can’t take a cow on holidays with us, but we will take our little dog, coco. I am looking forward to seeing our backyard, the real Australia. I have only been up the east coast to Hamilton Island and Airley’s Beach, and much of Victoria and some of SA. We watch all the 4WD shows, love Jason and Simon’s adventures, and Pat Callinan’s. They have wet our taste buds for travelling. Camping = freedom. Simple as that. 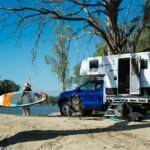 This Aussie built blue tongue camper offers the best in off road camping. Great rig with all the fruit. Sweet! Some of my best memories were spent with my husband caravanning around Australia and then free camping on various properties. On his death I have been using a tent which is difficult to manage at my age. Something more user friendly would enable me to go away more often with my family or solo as I do like to be independent but enjoy socialising. I love camping but have not been able to afford a decent camper trailer. Hoping to retire and sell up this place and travel. I’m single at this time but looking for a woman to travel with. Thanks for kindly offering this prize . (It does not go thru when I try to enter though) best of luck to others who are able to enter . Would love to upgrade from our old tent to something that doesn’t collapse on us at night. It would make camping with a toddler that bit easier and allow us to keep on going with our camping adventures ! we would use it to dramatically improve our camping experiences! Nearing retirement so would love to have an easy setup trailer to trip around Australia and go to more Hotrod Shows. This is magnificent country, and there is so much to see. Nothing beats laying under a carpet of stars and hearing no noise but the beat of your heart, as you unwind, recline and take in all this country has to offer. Lived South of Perth for 50 years. Got my 1st chance to go North this time last year – sleeping in my car! Would love to do it all again in comfort and this time go further! My partner and I do a lot of camping – we currently use a tent or our rooftop depending where we are going. Since having two small children I would love to upgrade to a camper trailer. This would make it a lot easier and quicker to set up and pack up. Having a camper trailer would also make it quicker in packing the car with all the essentials as the camper trailer would have the bed, washing up requirements etc. Since having children it now takes me a whole day to pack everything just to go away for the weekend, this is now causing me not to want to travel as much. I believe if I won the camper trailer my partner and I could keep exploring this wonderful country we live in with our children who already have a huge love for camping. We have been borrowing friends tents for the occasional family trip…have a towball but nothing to tow! Now our baby is 5, it’s time to show her the otways where I grew up, the campsites, oceans, rivers, waterfalls and above all- those endless stars! I would be over the moon if I won a camper trailer. Looking at the night sky in the great outdoors, nothing better. My partner and I like getting away from it all. Awesome giveaway! Recently retired and ready to go… What a great opportunity this would be for us to finally tour Australia… Good luck fellow thrillseekers…. Small towns! Back roads! The real Australia as my mum always says. We’d show our kids the slow life, pottering here and there. Visiting small caravan parks, small towns and communities around Australia. Taking out time and exploring anything that we come across. The perfect way to start our kids education on the amazing country we live in! Retired and now single. Love exploring, travelling and adventure. Although I have been around Australia in various ways I would love to take off, take my time, and travel the roads at pleasure. Good luck to all, but I really would love to be the winner of this divine BLUETONGUE CAMPER TRAILER, yeah. This is just amazing. I am so happy for you if you win. Wish I could celebrate with you! And if it be me…then I CANNOT WAIT to use it for the whole 2 weeks school holidays that are around the corner. My dream to travel around Australia has been for so many years, now the chance has come, in my sparkling new divine and adorable BLUE TONGUE CAMPER TRAILER. Should I be so blessed and lucky? Can’t wait to start exploring Australia when we join all the other grey nomads, would love to do it in a BLUETONGUE CAMPER TRAILER. I would love my hubby to take me on the road and Roam with this Blue Tongue Camper Trailer. Fantastic !!!! I am recently separated and am looking for a set up to take my 3 kids away in, but it has to be a simple, quick, 1-person setup. Most of our camping gear stayed with my ex. This would definitely suit our needs. I’m not sure if this comp is still going but I just saw it on TV on ‘The Great Aussie Doorstep’ I think it was called? Grandkids and the outdoors here we come ! My husband and I have work seven days a week for as long as I can remember with a short five days away maybe once every couple of years. would love to win this camper and start slowing down our busy work pace and see some of the sights that this beautiful country of ours has to offer. I could only hope to win something like this xo i could take my wife to see the Kimberlys bsfore we vet to old to do it. Easy to tow, easy to set up,easy to park,very convenient to use and, cheap to own. what more could you want? in our 70’s now would love to get back to nature only have mattress ..in the back of car. To be able to explore more of our awesome country in style, enjoyed by my wife and 3 children. australia loverly place to travelbut nee more than just a car and mattress.